How far do we allow social media to determine our lives, or, even taking over? 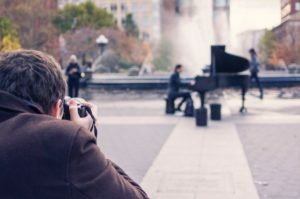 In this article, we dive into the world of the likes, the ones that make a living out of Instagram, Facebook and YouTube, and we research which classical music artists walk forefront. We also talk to famous pianist Boris Berezovsky and his daughter Evelyn, whom we met before their concert at Crans-Montana Classics, to talk about if they find it useful, and if it helps their career. Ever heard about ThatViolaKid? I had not, to be honest. His real name is Drewe Alexander Forde, and he studied at Juilliard and Mercer University, has 120K followers on Instagram, 30K on YouTube, and "only" 5.5K on FB. He calls himself an "acclaimed expert in classical music’s social media and brand building" and social media content creator. Let's have a look. Another social media active young musician and Instagram hit is Esther Abrami, violinist and model according to her FB musician page with 50k followers; 176K followers on Instagram, and 45k on YT. "Described as a 'rising star’ by Strings Magazine and as a ‘glamorous and influential star’ by Pianist Magazine, French violinist Esther Abrami has performed in world-renowned venues such as Carnegie Hall in New-York, the Wiener Konzerthaus and Leeds Town Hall." (source her FB musician page). A big hit on social media is Twoset Violin, founded in 2014 by Australian duo Brett Yang and Eddy Chen, and the absolute No. 1 when it comes to popularity! With 987K followers on FB, 268.7K on Instagram, and 988.8K subscribers on YT, they dominate all others, including many of the famous names within the classical music scene. Their total views on social media have gone over 300 million. At the end of 2016, the Twoset duo gave up their positions in the Sydney and Queensland Symphony Orchestras to become social media stars. Their mission is "Making classical music relevant to the modern generation through fun, humour and simplicity." (Source Twoset Violin website). Watch here the promo they created for their first world tour that ends this month in the US. 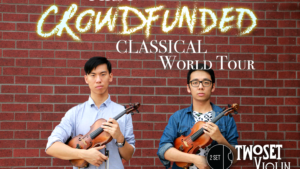 A Tour they crowdfunded themselves with nonstop playing and sleeping on the streets of Sydney until they hit their goal of $50,000—which they achieved in just 5 days! At the end of March 2019, they will have performed more than 28 concerts in Europe and the USA, all of them mostly sold out. What about established musicians of different generations? We compared the numbers with a couple of famous classical musicians, like Lang Lang; 498K FB - 239K Instagram and 56,9K YT or Daniel Barenboim 166k FB - 83,6K Instagram and 56,5K YT or Anne Sophie Mutter 185K FB - 25K Instagram, and I come to conclude that the digital era has taken over the popularity of great artists. It's about authenticity on social media and where Twoset violin and TheViolaKid manage their accounts themselves, many famous musicians are taken care of by their management or record label, something that millennials will recognize right away. Hence, time to talk to a famous musician in person! Boris Berezovsky and his daughter Evelyn recently gave a wonderful recital in Crans-Montana, during the winter festival of Crans-Montana Classics. "It's fun to do," says Boris Berezovsky and his daughter Evelyn uses it mainly to share funny pictures and videos on Instagram. Boris Berezovsky sees social media as a different planet and has not much time to spend there. Does he think it serves your career? Watch it yourself!